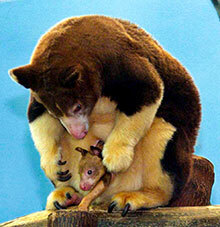 Matschie’s Tree Kangaroo—native to Papua New Guinea—is a critically endangered species. The Milwaukee County Zoo has long supported tree kangaroo conservation through its financial contributions to the Tree Kangaroo Conservation Program and its participation in the Tree Kangaroo Species Survival Plan captive breeding program. The Zoo’s longtime resident, Kiama, has produced a total of six joeys over the last several years, and in 2011 was the only captive North American tree kangaroo to produce offspring. The Tree Kangaroo Conservation Program is at the forefront of numerous strategic wildlife and habitat conservation programs to help this threatened species survive. On Saturday, August 6, in celebration of National Tree Kangaroo Awareness Day, the Zoo will hold its own Tree Kangaroo Awareness Day from 10:00 a.m. – 3:00 p.m. in the Australia building. The Zoo’s event this year has an exciting addition! Come experience a kangaroo-themed performance by Kohl's Wild Theater for this special occasion at 11:00 a.m. and 11:25 a.m. Kids can also color their own Tree Kangaroo masks—making them as unique as the individual faces of every tree kangaroo—and can then try to walk like a tree kangaroo along a tree limb. Join us for other special Tree Roo surprises for the kids! Learn about wild tree kangaroos and the Zoo’s wonderful animals, Kiama, Tia, and Ronji during our “Keeper Chat” and feeding at 11:45 a.m. Observe natural behaviors simulated through Environmental Enrichment at 1:00 p.m. The tree kangaroos will forage and interact with fresh leaves, hidden treats and investigate bubbles—a novel sensory experience! A zookeeper will be there to answer all your questions during the enrichment demonstration and throughout the day. Support the Tree Kangaroo enrichment program by purchasing a gift from its Amazon Wish List. Café Vita's PNG YUS coffee, grown in the YUS Conservation area of Papua New Guinea, will again be available for purchase this year at a discounted price. This organic, fair trade coffee (described as mellow and honey-like with flavors of hazelnut, orange zest, and guava) supplements income for the native people of Papua New Guinea who share the Matchie's Tree Kangaroo habitat. Sale of these unique beans helps to support the livelihood of native people working to preserve the tree kangaroo and its cloud forest home, with all profits going to tree kangaroo conservation. Free samples of this exclusive roast are available from 10:00-2:00, while supplies last!! 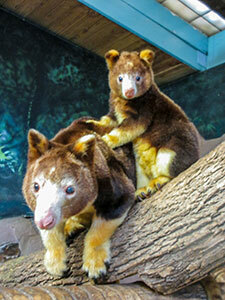 Join us for the Zoo’s special awareness day for the Matschie’s Tree Kangaroo!